Oh what a night! I was recently invited to the Llama Bar for the launch of their new Winter menu. I’d headed along to the Llama Bar when they recently did their big refurb and had been well impressed with their food, so was never going to say no to the chance to head back. I’d bought an extra ticket for $48 and had my darling GG in tow. We arrived a touch after 7pm and said hello to some fellow bloggers, the delightful Miss Anise and Miss Egg from Perth Food Engineers! It was actually my first time meeting Miss Anise, but I’ve run into Miss Egg a few times now, like old friends, always a pleasure! So we stood around and chatted until we were directed to our tables and did our best to find our assigned seats. 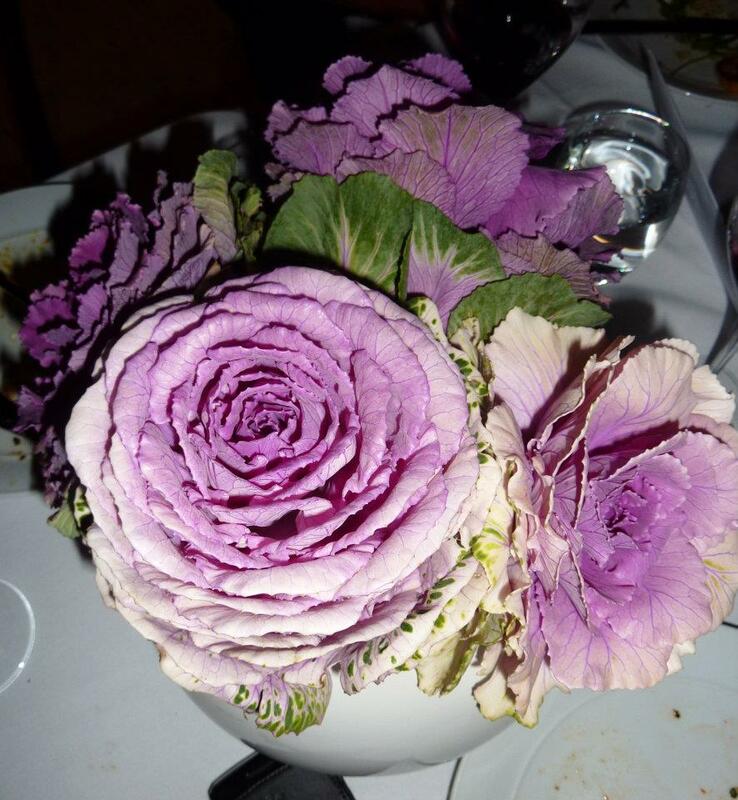 Mention has to go to the beautiful flowers they had adorning the tables. What is Kale? I’m not sure about flowers but I did like these ones. Even if they were just purple cabbages – loved them! We introduced ourselves to the folks around us, including Llama Bar owner Tim and his wife who were sat opposite us. The first food addition to the table was Baked rye roll with beetroot balsamic and Dandaragan evo oil. Funny story, but back in the day, I spent a little time pruning olive trees at Dandaragan Estate…. but I digress. We cut off chunky pieces of the rye bread and there was still some warmth to it. Oh bread! Delicious! Especially when teamed with good olive oil and the contrasting zappy sweetness from the beetroot balsamic. I was excited about the dishes ahead! Dishes were brought out in series and our first was Tea smoked duck, apple, hazelnut, rhubarb then Flash fried baby squid, dill, red tapenade, grilled lemon and then Salad of rocket, pear, baked ricotta. 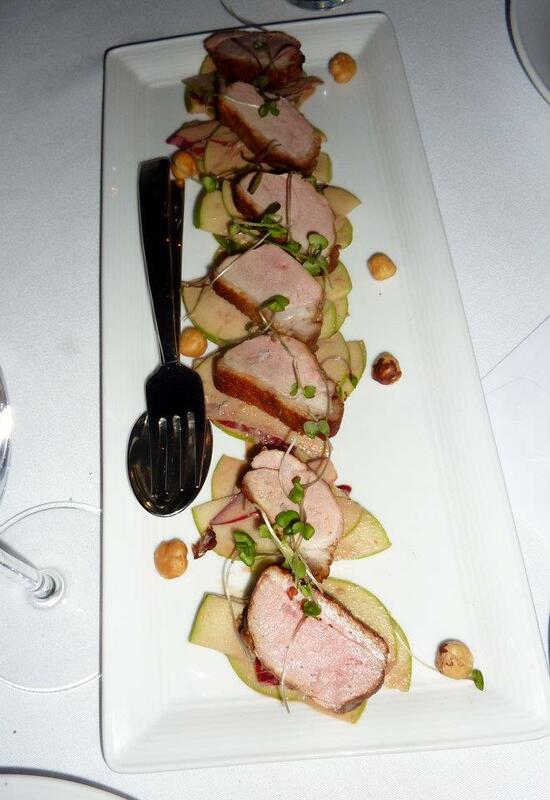 The tea smoked duck – wowsers, what a punch of smoky goodness it had! Teamed with the refreshing combination of the crunchy apple, hazelnuts and one of my recent favourite, rhubarb, it was definitely well received by GG and myself. Similarly, the squid just melted in your mouth! 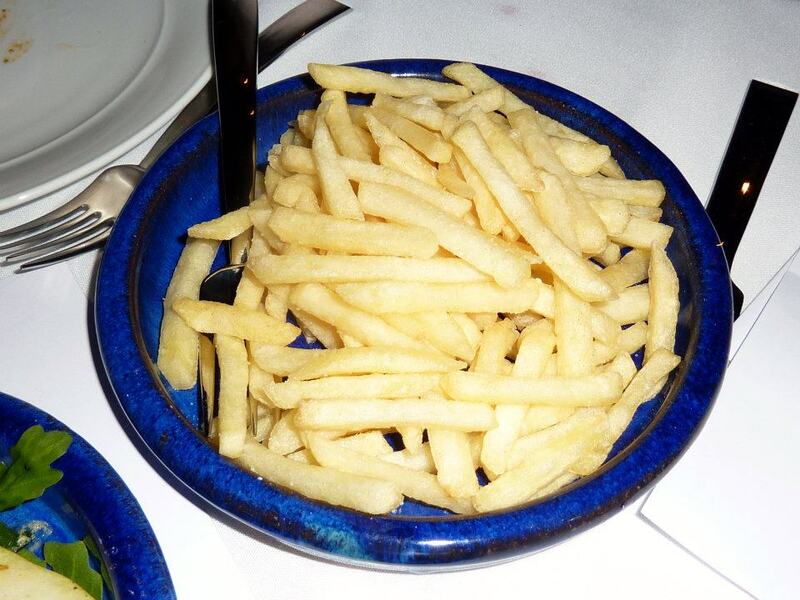 Definitely no concerns about rubbery chewiness with the flash frying wonder that Chef Paul had opted for. 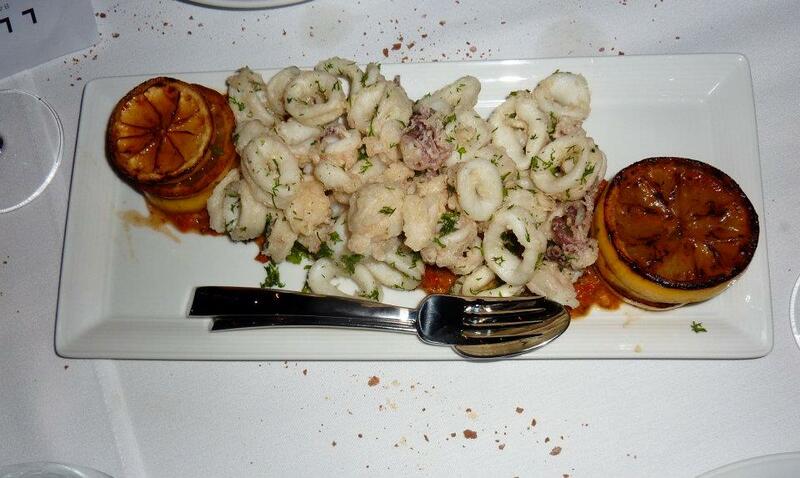 I also decided to get my hands dirty with the grilled lemon and gave a generous spritz on top of my squid. Well worth getting it all over my hands, because there was this wonderful carmelisation to the zesty lemon flavour. 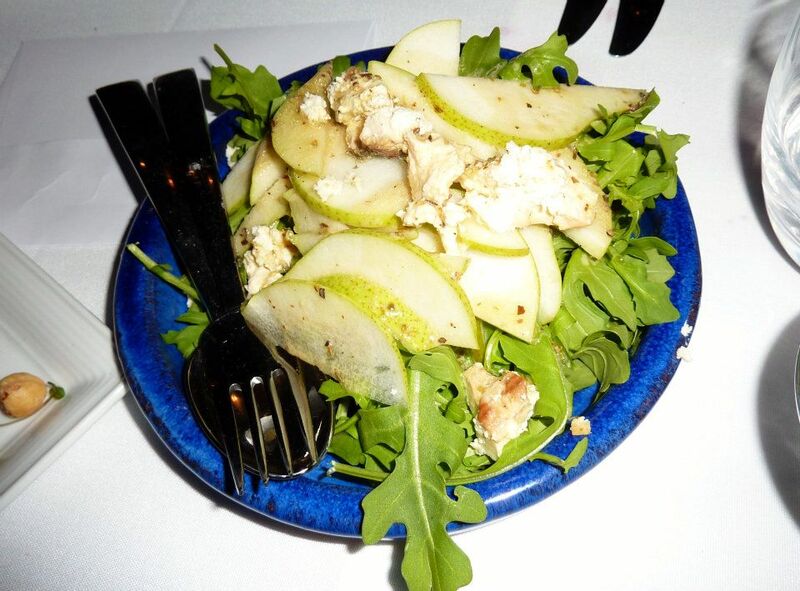 And finally the pear and rocket salad, yes generally a fairly popular combination but the baked ricotta, really added some extra depth. A nice creaminess, which teamed well with the crunchy pear sweetness. We were off to a flier! 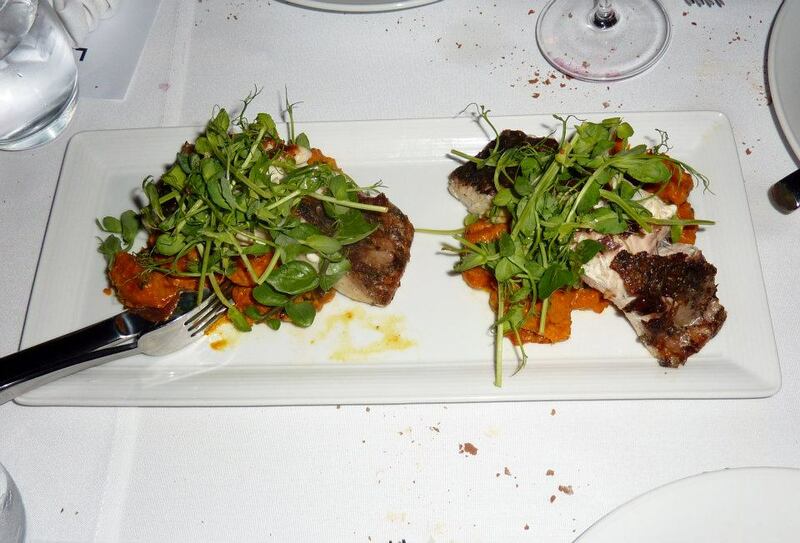 The second round of dishes was Barramundi, pumpkin, coconut, coriander, ginger, along with Steak tartare and Pomme frites. 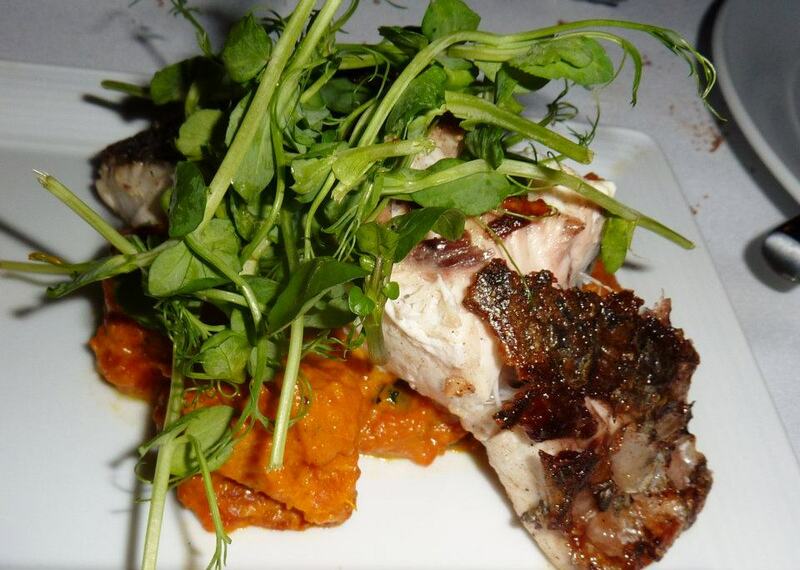 I didn’t mind the barramundi, thought it was well matched with the pumpkin and there was a nice crispiness to the skin. Our final round of dishes was Moroccan chicken cigars, spiced mango, yoghurt along with Gnocchi, rabbit, slippery jacks, fresh horseradish, clotted cream and the veg – Steamed broccolini, harissa, dates, pinenuts. 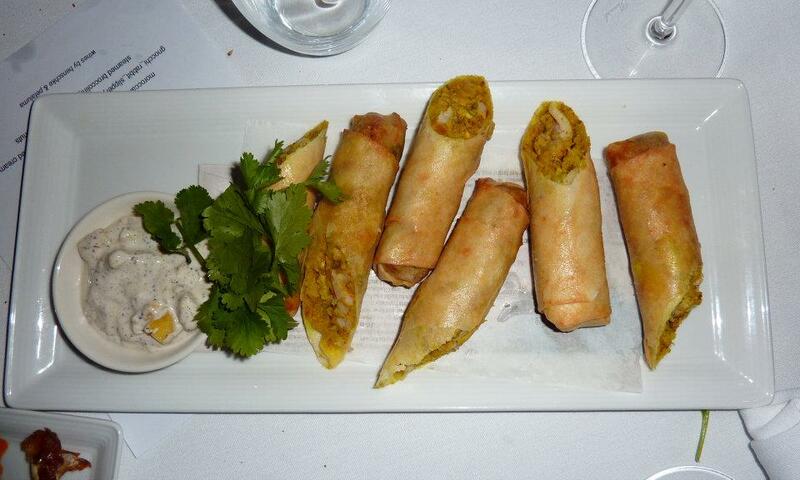 The chickeny cigars were sort of like a jazzed up Moroccan style spring roll. They were nice and I think the flavour was well balanced with the creamy mango yoghurt dressing. 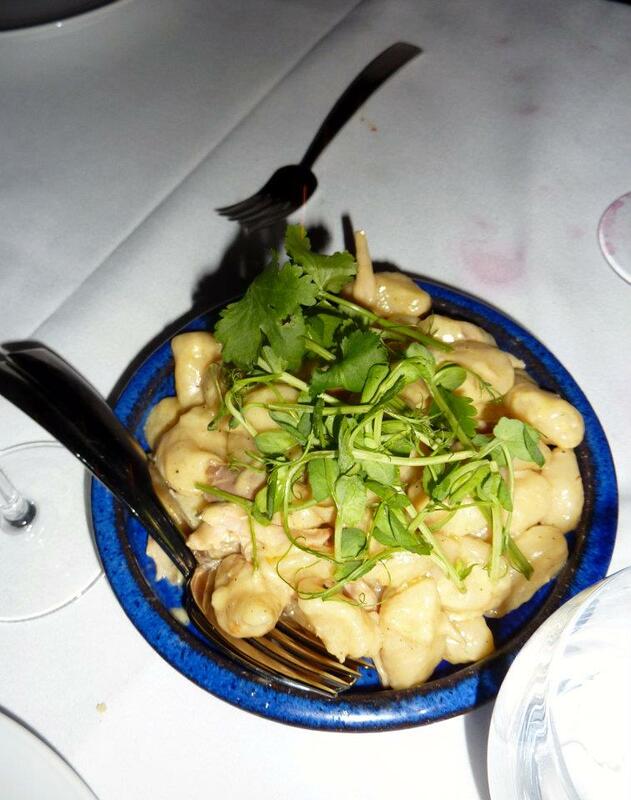 I am the hugest gnocchi fan and I didn’t mind this gnocchi dish. Admittedly I probably prefer my gnocchi a little softer (baked ricotta gnocchi is one of my faves!) and I was don’t think I snagged much rabbit, so I don’t think I really got to experience a true representation of this dish, but hey I’d be willing to give it another whirl with a bowl to myself. Tehehe sharing is a nice idea though I suppose. 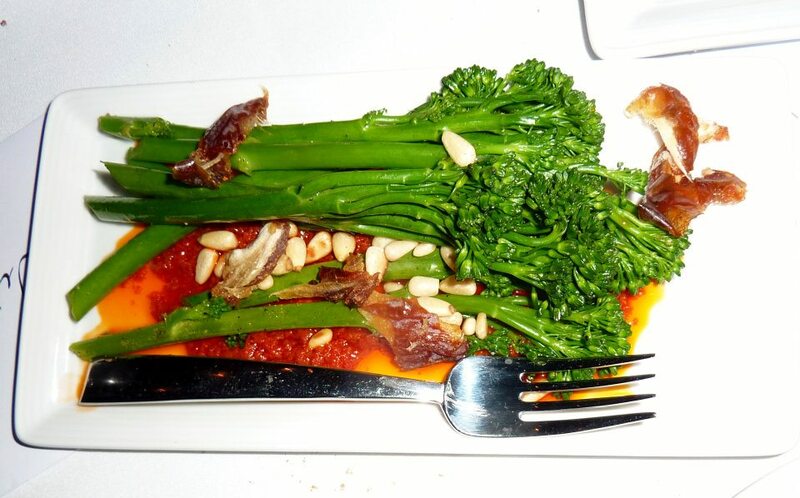 And yes, I’d give mention to the broccolini, wonderfully crunchy and it had a fab spiciness with the harissa. So while we had been enjoying all this delicious food we were also partaking in a glass or two of wonderful vino courtesy of Henschke and Petaluma. I had really enjoyed my evening at the Llama Bar. The company was brilliant, the food was particularly impressive and I’d even gotten to chat to Chef Paul!! Always a bonus to speak to the man behind the amazing food. 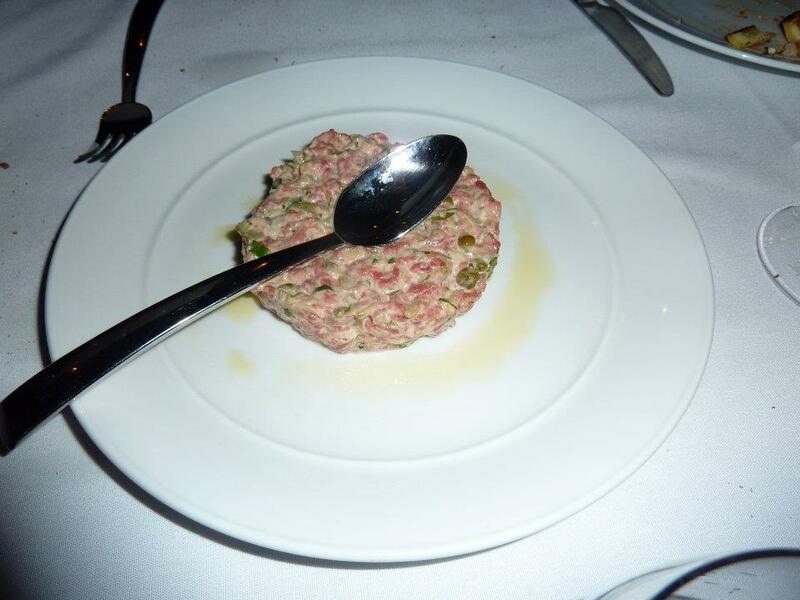 Tartare is definitely worth trying – done right it’s just amazing! !